Watch Blankscreen's Trippy Video for New Single "Passing Over"
Formed in August 2017, Toronto post-punk trio Blankscreen have made some impressive waves in the city's underground scene over the past year. Their debut Century EP, released this past April, was celebrated with a sold-out release show at the Baby G and earned them an opening slot for Chastity. Today, Blankscreen debut a new track, "Passing Over," and its accompanying video. 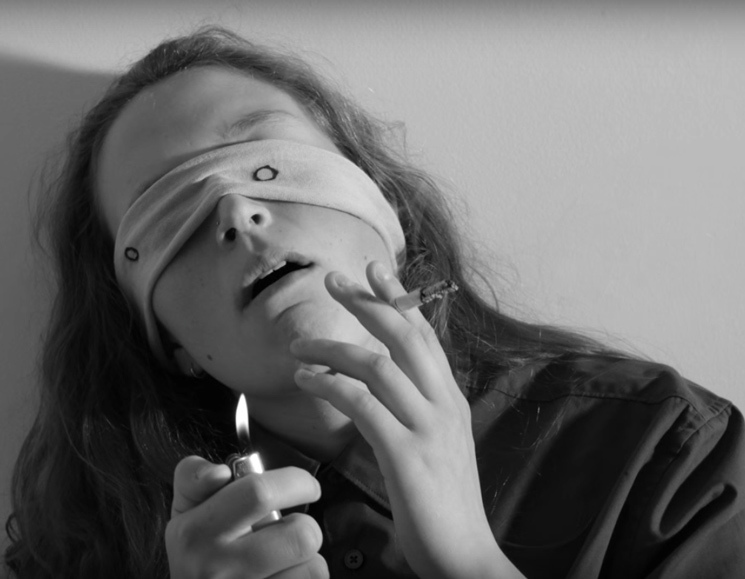 Shot by abstract photographer Nadeem Oudeh and directed by Jordan Lee-Tung, "Passing Over" mashes up jarring black and white visuals amidst stop-motion frames of the band. Singer-bassist Sam Reilly, drummer Robyn Bond and guitarist/synth player Evan Moore tear at their clothes, pound the walls and light up cigarettes, all while donning rags with eerily drawn-on eyes over their faces, as "Passing Over" builds to a forcefully controlled yet thunderous crescendo. "We mostly try to keep our songs ambiguous enough that anyone can appreciate their intangible qualities while inserting their own experience into it," Blankscreen tell Exclaim!. "["Passing Over"] deals with fear and the occult, but also themes of isolation and feelings of hopelessness in a social/political landscape that's all flash and no bang." The trio will play a handful of northeastern U.S. dates this fall, as well as a local Toronto gig while prepping their next recorded release. See below for a list of upcoming shows before scrolling down to check out the "Passing Over" video.